Algerian President Abdelaziz Bouteflika, reported on Sunday to be seeking a fifth term in April elections, has had a long stint as head of the North African country. – April 15, 1999: Backed by the army, he wins presidential elections after all six of his rivals withdraw, alleging rampant fraud. – September 16, 1999: Algerians overwhelmingly approve a referendum on Bouteflika’s civil reconciliation programme which offers partial amnesty to Islamic extremists involved in the conflict, in which 200,000 people died. Some 15,000 Islamists finally laid down their arms and a state of emergency is lifted in 2011. – April 9, 2009: After changing the constitution to allow himself another five years in office following two mandates, he wins a third term with 90 percent of the votes. – January 2011: Food riots erupt amid the regional upheaval of the Arab Spring and five people are killed and more than 800 injured. It pushes Bouteflika to announce political reforms in April but the opposition says the measures are insufficient. 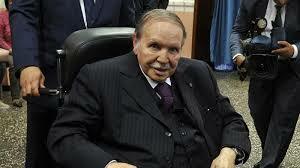 – April-July 2013: Bouteflika spends almost three months in hospital in Paris after suffering a mini-stroke. He will make several hospital stays in Europe in the future. – April 17, 2014: He is elected for a fourth term with 81.5 percent of the vote, despite not campaigning and voting from a wheelchair. His announcement in February that he would run for office was met with opposition from senior military officers and protests as his poor health stoked doubts over his ability to govern. – January 30, 2016: He tightens his grip on power by disbanding the DRS intelligence agency, considered by many a “state within a state”. Its chief, the powerful Mohamed Mediene, had been already been fired months earlier. – February 2, 2019: The four parties in the ruling coalition give their official support to a candidacy by Bouteflika at the presidential election he has called for April 18. – On the 10th, the official news agency APS says that Bouteflika, 81, is to seek a fifth term.